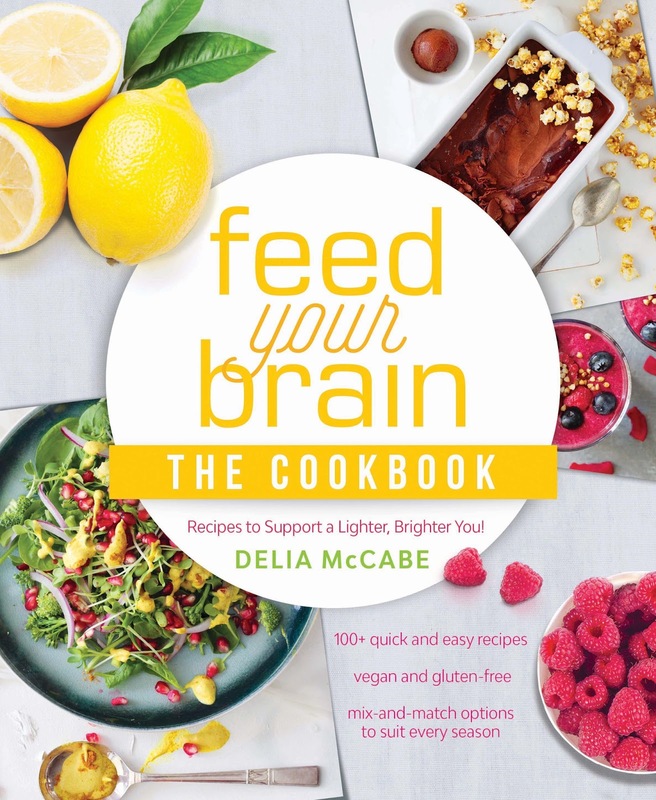 Delia McCabe has over 20 years of research into brain health and nutrition up her sleeve, and has previously released the highly successful book, Feed Your Brain: 7 Steps To A Lighter, Brighter You! Now she is back with her latest book, which not only shares Delia's hints and tips about foods that are not only healthy for your body, but for your brain too. The layout of the book is great. It is simple to follow, and there's a lot of information about adding extra nutrients to our diet, as well as information about the nutritional benefits of certain foods including nuts, legumes, vegetables and fruits. I also like that it isn't bulky or heavy like many cookbooks tend to be. Lightly steam the corn and peas over boiling water for 5 minutes and then remove from the heat and cool on a large plate. Over a sieve, drain the liquid off the cucumber sticks. In a large bowl, combine the remaining salad ingredients. Add the corn and peas and toss together, then toss in the drained cucumber sticks. Serve immediately with the salad dressing on the side. Replace the coriander with finely sliced fresh basil leaves. Flower petals can add colour and interest to salads — just make completely sure they are pesticide free and edible, and don’t add too many, because some petals can be quite spicy. Use the flowers of chives, garlic and leeks, as well as borage, calendula/marigold, carnation and jasmine petals. Chamomile flowers, along with coriander (cilantro) and dill flowers, are pretty and tasty, while citrus blossoms are highly scented and can be overpowering. This is a beautifully bright and wonderfully flavoured dressing. If you’re short of time, simply use a raw red pepper. 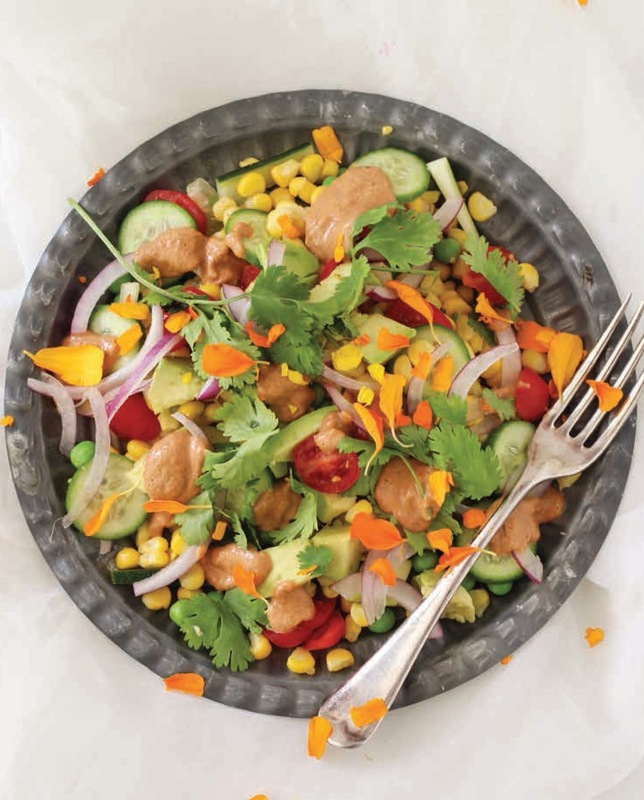 Salads with asparagus, tomatoes and butter lettuce go well with this dressing, as well as any salad containing quinoa (such as on page 102). Refrigerate in an airtight glass container for up to 5 days. Roasting capsicum (bell pepper) enhances its natural sweetness. Simply put your fresh capsicum on a grill, turning regularly for 10–15 minutes until the skin is blackened. Transfer them to a large glass bowl and cover with a tea towel. When they are cool enough to handle, remove the black skin and seeds and you are left with lovely strips of smoky capsicum. Combine all the ingredients in a blender and blend until smooth and creamy. 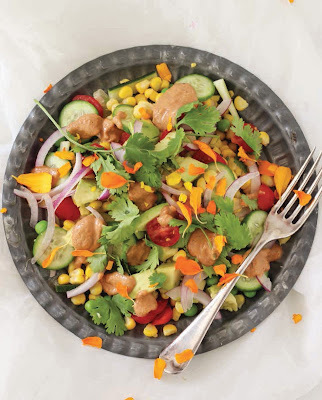 Serve as a dipping sauce or with the gorgeous green garden salad on page 96. Mangoes are a summertime fruit, so it’s the perfect time to make mango ice-cream. This is a very simple recipe to make, because you simply combine all the ingredients, practise patience overnight, and wake up to delicious, golden mango ice-cream. You can use popsicle moulds to freeze in individual portions, but you don’t have to — it’s perfectly fine frozen in a glass container too. Combine all the ingredients in a blender and blend until they form a smooth and silky cream. Transfer the mixture to either popsicle moulds or a glass container that can hold 6 cups of liquid. Freeze overnight. If you are using a glass container, remove about 10 minutes before you plan to serve the ice-cream, because it needs to thaw slightly. 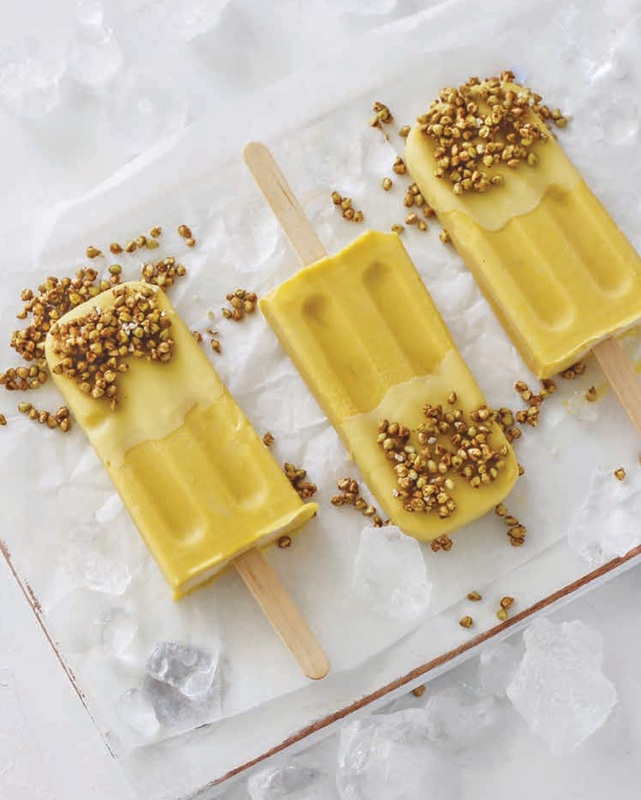 If you make popsicles, dip the bottom into some plain white chocolate^ and immediately dip into some buckwheat nibbles * or roughly chopped almonds. As you can see, these recipes are healthy and delicious, and the best thing is that these recipes can be enjoyed by the whole family, including the kids. From Feed Your Brain. The Cookbook, by Delia McCabe. Available from www.exislepublishing.com and wherever good books are sold. 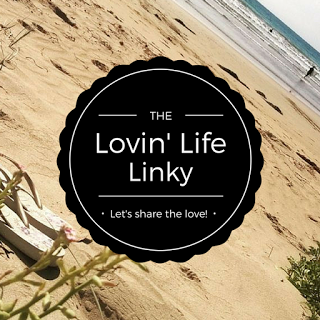 RRP $34.99 Images from Vanessa Russell. Thanks for your positive comments about my book - I'm so pleased that you're enjoying the tips and tricks, the extra information and the layout! Please be sure to download the 'Extra Resources' from my website to support even more creativity in 'feeding your brain' with delicious, colorful and nutrient dense foods!